Tuesday October 12th 1881 I went down town just before noon and Charlie and I went up to Harris a few moments. Charlie took dinner at Miss Lewis. It rained all the afternoon and evening Wednesday October 13th 1881 I was down town a little while this morning and in the afternoon went down to the Harris house and Bird went down town with me. I got a new hall lamp and looked at some furniture. It rained so we hurried home. Charlie spent the evening with us. 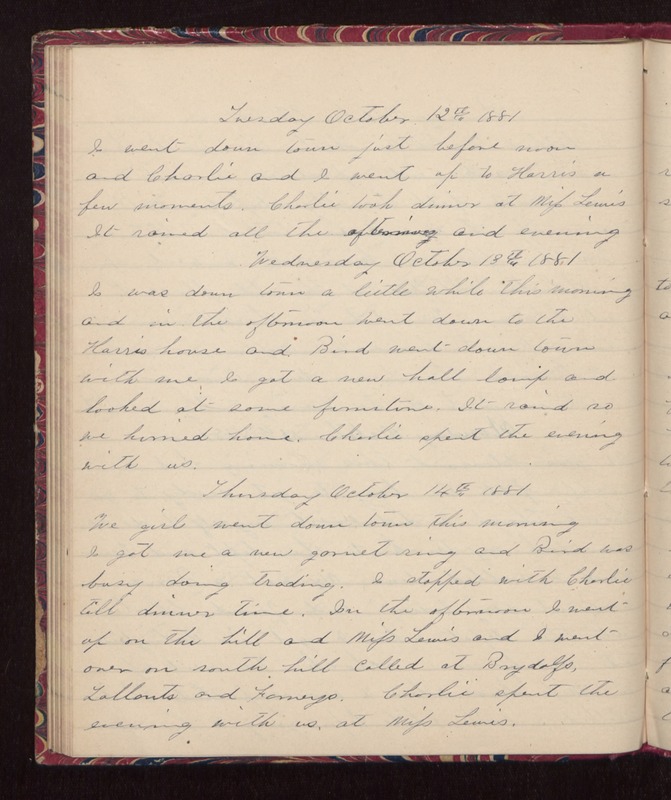 Thursday October 14th 1881 We girls went down town this morning. I got me a new garnet ring and Bird was busy doing trading. I stopped with Charlie till dinner time. In the afternoon I went up on the hill and Miss Lewis and I went over on south hill. Called at Brydolfs, Tallants and Furneys. Charlie spent the evening with us, at Miss Lewis.